Kitchen drain clogged - MrFix finds you a reliable plumber or fitter within 3 hours. Kitchen drain clogged - MrFix finds you a reliable plumber or fitter within 3 hours. Kitchen drain clogged? Ask plumber service MrFix! How do I request a plumber? Ik zoek een loodgieter in Den Haag om mijn CV (Intergas HRG) te onderhouden en keuren. Plumber wanted in Amsterdam to unclog my kitchen drain, which has been clogging for a long time. I just installed the new kitchen with a new drain pipe but the problem still exists and is getting worse. I hope this can be completely fixed now. MrFix rates are fair and transparent. For plumbing we charge a fixed rate of €80 per hour including VAT and call-out charge. Holland likes water but also fights water. The same is true for your home. Water quality in Holland is very good, but at the same time water may cause a lot of problems. In case of clogging of your kitchen drain you may be limited to having take away meals with disposable plastic plates only. If you are lucky the dish washer has its own drain, but quite often it makes use of the same drain. MrFix has contracted experienced plumbers to help you out! Don’t take the risk and hire a professional plumber or fitter: MrFix will have one at a fair rate. When living in an apartment leakage or clogging may involve other risks: causing damage to your neighbours’ properties. If you don’t have a liability insurance for that then it is even more important to take good care of your water and drain systems. Safety and reliability are top priority for MrFix. Therefore we selected reliable and experienced fitters and plumbers only. We will help you to maintain a sound and safe living environment for you and your family. It’s simple: fill out the form above and we will match your job with the right professional within three hours. Easy, right? MrFix has a plumber available even today, if you wish. Make your “DETAILED DESCRIPTION OF JOB” as precise as possible: please specify the problem, materials, measures, obstructions or other limitations. For good quality and sustainable plumbing work we can arrange an experienced professional at a fair rate. Use our expert to unblock your kitchen-drain, unclog your toilet or install a new outlet. Our plumber will do the job in a professional way. For further questions about plumber rates see the Rates page or call us on 020-675 0333 (Mon-Sat 8.30-18h). You can contact MrFix via the site 24/7 for emergencies and other urgent plumbing jobs. We will connect you to the right plumber for your job within 3 hours, and often faster than that. MrFix-approved plumbers do your job right 1st time: every plumber who works through MrFix has been screened by MrFix. According to Marcel most blockings are caused by greasy oil or rigid pieces of food or other material which remain rigid in water. Solution: use kitchen paper to remove greasy oil from pans before washing them and remove any rigid pieces from the sink before they will flush into the drain. When your kitchen-drain is clogged and you don’t like the take away food you want to have it unclogged as soon as possible. MrFix helps you find a plumber for your rush job, even during evening hours and at weekends. No problem for MrFix’ certified plumbers! 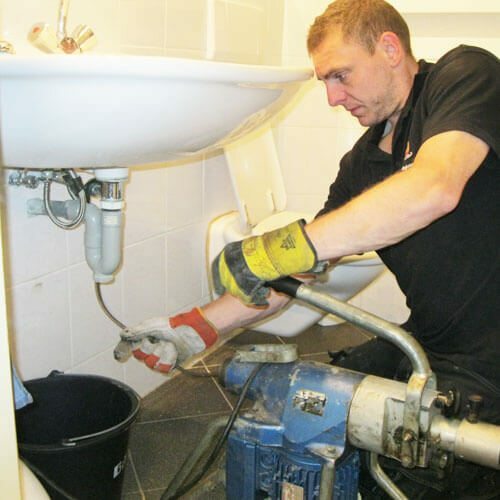 Our skilled plumbers are ready to do every conceivable urgent plumbing job in Amsterdam, The Hague and the rest of Central Netherlands with quality and accuracy. Complete the form and we will match your job with the right plumber within 3 hours. If you prefer you can also mail, call 020-6750333 (Mon-Sat 8.30-18h) or send a WhatsApp message to 06-15380087. The work of our qualified plumbers is covered by a triple guarantee: 1) the guarantee by the plumber himself. 2) his liability insurance and 3) MrFix’s leverage over the plumber. So you are in safe hands. For jobs that must start within 24 hours, after 18h or on weekends we charge a surcharge of 50% on the labour. We at MrFix can get your home, shop or office repaired or improved by the right expert from our wide range of partners. Beside plumbers MrFix can quickly connect you to a skilled Painter, Handyman, Electrician of other Specialist. In addition, MrFix offers the Home Check: our expert will check your home with you for child, burglary and fire safety and, if you wish, he will check the energy efficiency of your home. Request the Home Check here or call us for further information on 020-675 0333 (Mon-Sat 8.30-18h). Need a plumber in your region for unclogging your kitchen drain? Whatever your plumbing job is, MrFix has the best network of experienced, reliable plumbers in Amsterdam, Rotterdam, The Hague, Utrecht and elsewhere in Central Netherlands. Fill in the form , then we will match you as quickly as possible to the right plumber or other expert in your region.